Galena was home to nine Civil War generals including Commanding General of the Union Army Ulysses S. Grant. Being a Civil War buff, I jumped at the chance to visit the Ulysses S. Grant Home while on a recent weekend trip to Galena. The Grants originally settled in Galena in 1860 to work in a store owned by Grant's father, Jesse, and managed by his brothers. Initially, the Grants rented a home. At the outset of the Civil War, Grant helped recruit volunteers from Galena. He was commissioned as the Colonel of the 21st Illinois Volunteer Infantry Regiment. Grant would rise through the ranks eventually commanding the Union Army. Grant would go on to accept Lee's surrender at Appomattox Courthouse, Virginia in 1865. Grant's favorite chair still rests in his home. 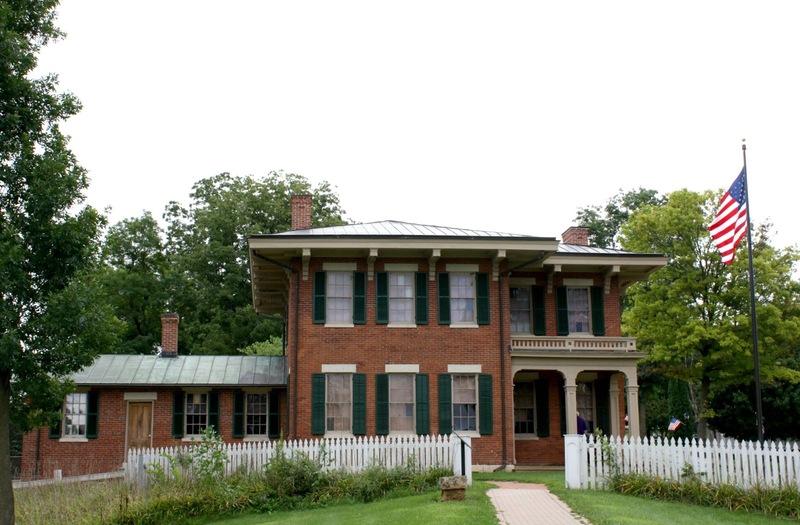 When Grant returned home to Galena in 1865, the grateful town gifted his family with this fully furnished Italianate brick home. 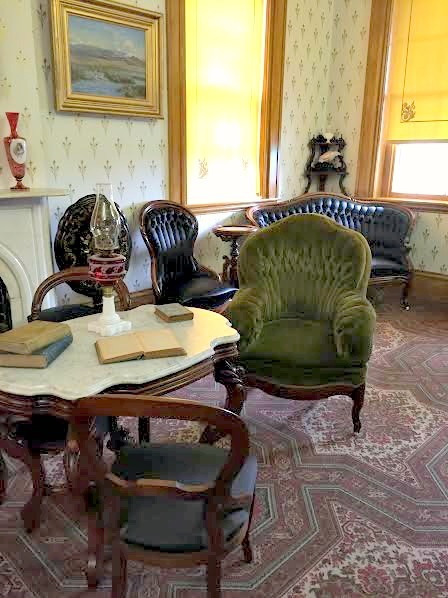 Many of the items in the home are those of the Grants or pieces from the period in which they lived in the home. Pictured above in the formal parlor is Grant's favorite green chair. I can totally see why this was his favorite! It looks comfy compared to others I have seen from the period. A pianoforte like the one Julia and daughter Nellie would have played. Tours at the home run regularly, so visitors will not have a difficult time hopping on one. We benefited from a detailed, guided tour on the first floor. I was impressed by how much history was packed into a short time! To continue the tour upstairs, we mounted some steep, windy stairs. I can't imagine walking those every day! The second floor portion of the tour was self-guided providing us with peeks inside of the Grant bedrooms. 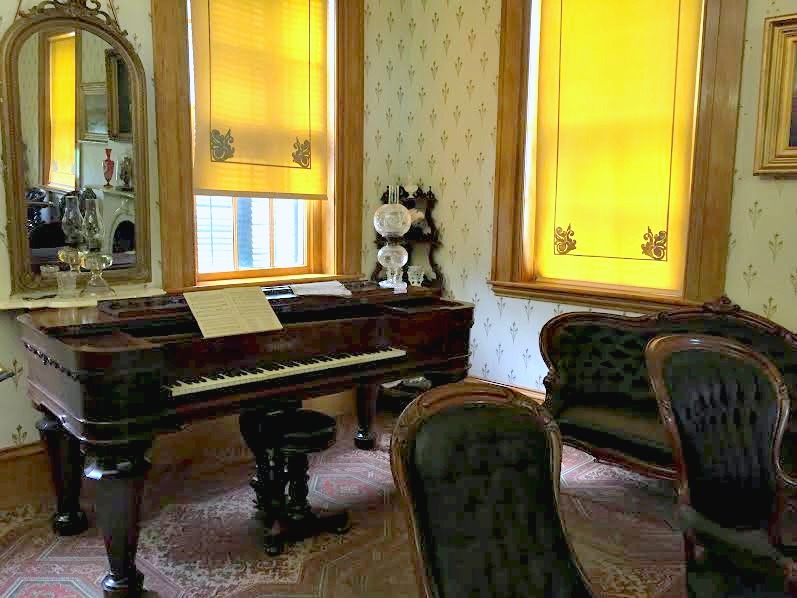 Since the house retains so many of the family's artifacts, each room contains an incredible amount of detail--more than I have seen in other historic homes. 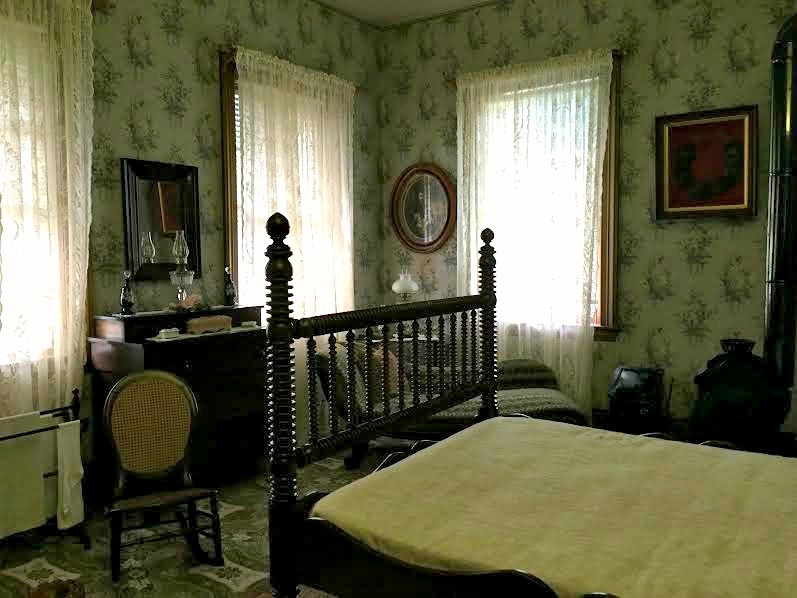 Pictured above is the Grant bedroom. Galena as viewed from the U.S. Grant home. After the tour, we walked around the property. 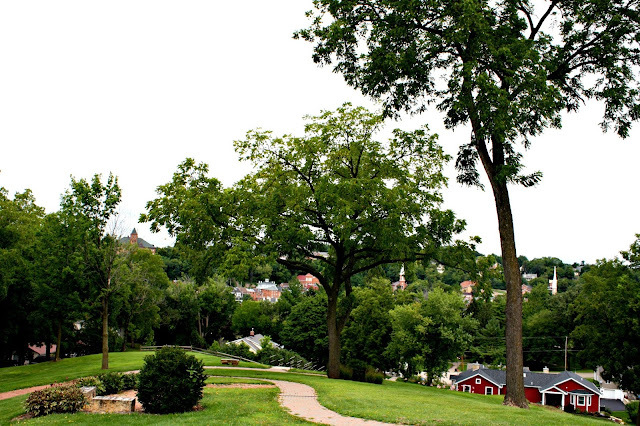 Nestled in the trees, you can pick out downtown Galena in the distance. Historic log cabin built in 1851 in Elizabeth, IL and moved to Galena. Upon wandering the area, you will find a statue of Julia Dent Grant and a General Store with authentic scenes displayed inside. Also nearby is a historic log cabin constructed in 1851 in nearby Elizabeth but moved to Galena. 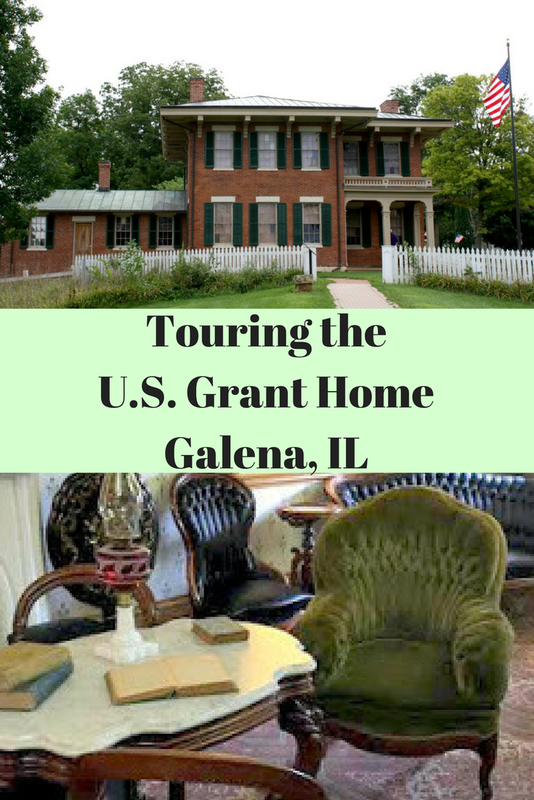 The U.S. Grant home is well worth a visit when visiting Galena! The home is open Wednesday-Sunday 9AM-4:45PM (last tour at 4:45PM) and closed on certain holidays. I love that it opens at 9AM because it is such a wonderful way to begin your day and enjoy the history of Galena! Since the tour is fairly brief, it is more family friendly than ones that run an hour or longer. The home is located at 500 Bouthillier Street but you will easily locate it due to all of the signs leading the way! Tours are by suggested donation of $5 per adult, $3 per child. I do recommend donating so we can help keep historic treasures like this open for future generations. This looks great! We've been to Galena several times but have never made time for this tour. Galena is on my bucketlist but I didn't even know that this was there- definitely adding this on to the list! Thank you so much for sharing! !